Only shipyard located in the heart of Newport, located on the northeast side of the harbor, just before the Goat Island causeway and within a short walk to all downtown highlights. A truly exceptional place, vibrant with high energy and as enjoyable for crew as it is for owners and guests! Known in the region as ‘THE Shipyard,’ is a highly recommended shipyard, able to handle major refits and repairs on yachts of any size, as well as one of the most popular marinas in the USA. 3,500 linear ft of floating docks • Max LOA 350ft • Max draft 22ft • Power up to 400 amps / 480v 3 phase • Water • Pump out • WiFi • Fuel available at the slip via truck or fuel barge • Mail & package hold • FedEx/ UPS/ Express Mail shipping • Cable TV & phone • Heads & showers • Laundry with washer/dryer • Fenced facility • Nightly security watch • VHF 09. Onsite: Full service shipyard, full size chandlery, plus an array of yacht related services such as crew placement, brokerage sales, insurance companies, yacht concierge, yacht maintenance, carpenters, surveyors and more. Plus, the highly popular Belle’s internet café, serving breakfast and light lunch indoor or on nice waterfront picnic tables, spacious crew lounge with computers, brand new gym open to guests, self storage containers, recycle bins, large parking area, carts. The harbor shuttle to downtown restaurants/ shops also stops in the marina. Public buses to the area and to Boston stop at the front gate. Equipment includes 330t, 100t and 70t marine travel lifts, a 60t trailer, and 50 and 15t hydraulic cranes. Paint shed for yachts up to 130ft, machine, electrical and carpentry shops for repair and refit. Manager Charlie Dana and his son, Dockmaster Eli, can be proud to have created a pristine working facility combining at its best a unique mix of leisure atmosphere and productive activity. Newport Shipyard hosts major yachting events every year under big tents set up for the occasion and plays a big part in the local social scene. Extremely popular among the most prestigious Superyachts. Fantastic event at the Newport Shipyard! Lots of fabulous all plant based foods to sample from prestigious vendors, fantastic speakers including Matthew Kenney Cuisine coming from CA and perfect weather. Newport Shipyard received final approval from the Rhode Island Coastal Resources Management Council (CRMC) on Tuesday, March 28, to expand its dock space by 560 additional feet. 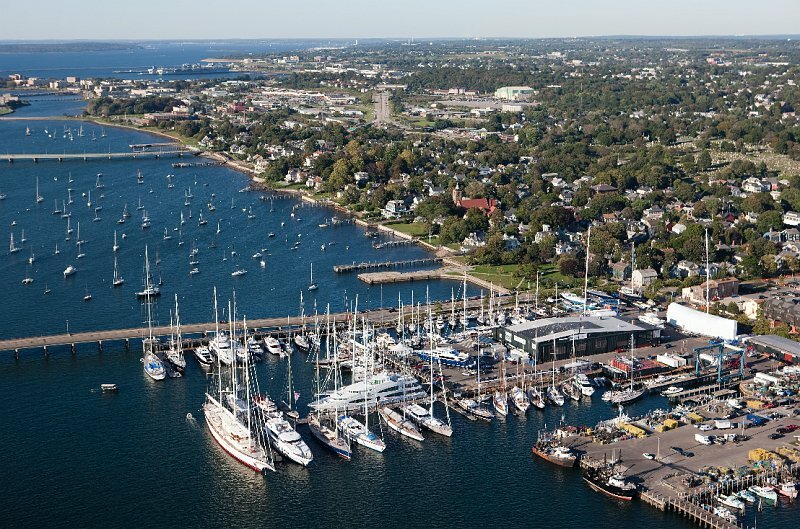 This added dock space, which will allow Newport Shipyard to handle more large yachts simultaneously, will add on to its current 2,833 feet of dock space, which will generate an estimated $500,000 in revenue annually. Lewmar is committed to growing the USA market and widening its footprint on the power and sailing yacht markets by offering greater access to its services and products for current and future clients. As such Lewmar selected Newport for its new office, "America's sailing capital" and a yachting destination of choice. At the center of the action is Newport Shipyard with the biggest lifts, outstanding facilities, and the most dock space in town, a prime location for many major refits to both power and sailing yachts and the hosts of the most prestigious mega yachts in the USA. Superyacht mast pulled, filmed by a Drone. This is Superyachting. 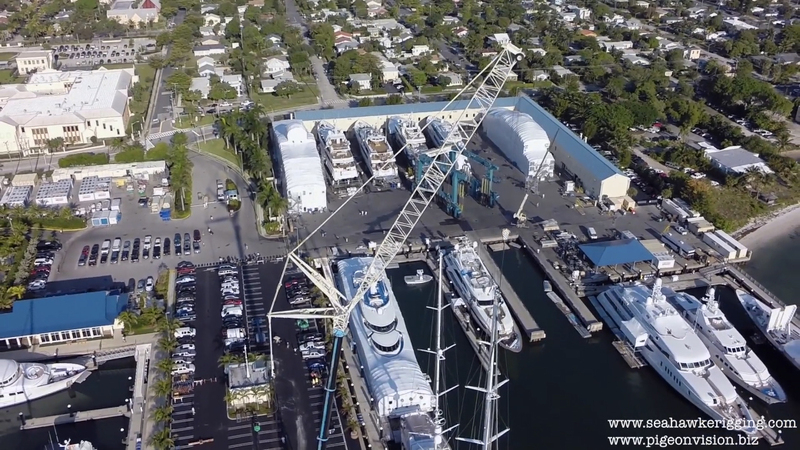 Check out this video by http://www.pigeonvision.biz/ of a mega-yacht mast beign unstepped at Newport Shipyard in Newport, RI. The 2015 St Barths Bucket Regatta event details will be updated in the coming weeks. Superyacht mast pulled, filmed by a Drone. This is Superyachting. from Pigeon Vision on Vimeo.